Today, we had our first Skype call of the year from Mrs. Lirenman's class in British Columbia. We are both reading Charlotte's Web for the Global Read Aloud. 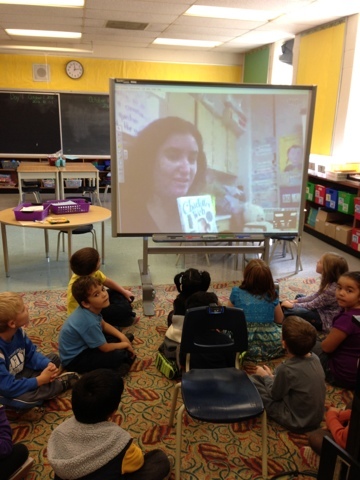 Mrs. Lirenman and I introduced the book to our classes and then our classes shared their predictions with each other via Skype. We have some new students in our class this year, so before we Skyped with Mrs. Lirenman's class, we made an anchor chart titled "Skype Norms"
1. Be still (movement is distracting to the people we are talking to). 2. Speak clearly and loud enough for the guest(s) to hear you. 3. Use attentive listening (eyes, ears and heart on speaker). 4. Raise a quiet hand to answer a question. 5. When speaking on the Skype call, state your name first before you speak. Our first Skype call went very well, one of the students said, "it was Skypetastic!". We are looking forward to reading chapter 5 of Charlotte's Web on Thursday with Mrs. Lirenman's class as well as 2 other classes via Google Hangout. We also read chapter one of Charlotte's web. We are one of the classes that you will meet on google hangout on Thursday. We are excited to hear Chapter 2 tomorrow. When we finished chapter 1 we retold chapter 1 using our own pictures and words. Tomorrow we are going to draw pigs in our books. Thanks for skyping with us this morning. 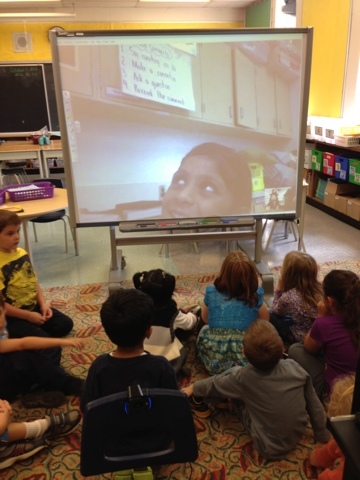 It was great to meet your class and I love your Skype norms. We had a bit of a busy start to our day as a new student joined us just minutes before the call and we didn't realize he was coming. Then, I'm not sure if you know or not but we had a nose bleed in the middle of the call too. But, such is life in busy grade one classroom. Can't wait to see you and your class on Thursday as we read with Mrs. Leech, and Mrs. Sarchet's classes too. Can't wait to skype with you again soon too. More predictions perhaps? Mrs. Leech We are going to read chapter 4 of Charlotte's Web today. What does your class think will happen with Wilbur? We would love to see your pig pictures.